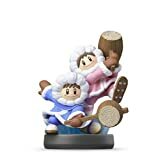 Ice Climbers first appeared in the 1985 release of the Ice Climber game. The boy is Popo and the girl is Nana. They jump with hammers in hand as they aim for the summit. Get cool in-game extras with amiibo accessories and compatible games. Just tap an amiibo accessory to the NFC touchpoint on a compatible system to enjoy fun in-game extra features in compatible games on the Nintendo Switch system, New Nintendo 2DS XL system, New Nintendo 3DS XL system and Wii U console. Games, systems, and amiibo sold separately. Visit nintendo.com/amiibo for details on amiibo functionality.